Human anti Mouse IgG3 antibody, clone AbD04582 recognizes mouse IgG3.  No cross reactivity is seen with other mouse immunoglobulin sub-classes, rat immunoglobulins, or sheep, bovine and goat IgG. A bivalent human recombinant Fab selected from the HuCAL® GOLD phage display library. Expressed in E. coli and purified using NiNTA affinity chromatography. This Fab fragment is dimerized via a helix-turn-helix motif. The antibody is tagged with a myc-tag (EQKLISEEDL) and a his-tag (HHHHHH) at the C-terminus of the antibody heavy chain, and is conjugated to fluorescein isothiocyanate (FITC). A bivalent human recombinant Fab selected from the HuCAL® GOLD phage display library. Expressed in E. coli and purified using NiNTA affinity chromatography. This Fab fragment is dimerized via a helix-turn-helix motif. The antibody is tagged with a myc-tag (EQKLISEEDL) and a his-tag (HHHHHH) at the C-terminus of the antibody heavy chain and is conjugated to horseradish peroxidase. A lyophilized, bivalent human recombinant Fab selected from the HuCAL® GOLD phage display library. Expressed in E. coli and purified using NiNTA affinity chromatography. This Fab fragment is dimerized via a helix-turn-helix motif. The antibody is tagged with a myc-tag (EQKLISEEDL) and a his-tag (HHHHHH) at the C-terminus of the antibody heavy chain. Reconstitute with 0.5 ml distilled water. The addition of sodium azide is recommended for long term storage following reconstitution.